Last updated 20 June 2018 . By Anisah Audu. Surf and turf: the age old combination of seafood and red meat that gets my mouth watering. While the origins of the term are under much debate, I think we can all agree that the classic combo is having a moment right now. There’s something so satisfying about reaching each bit of lobster, as if I’ve worked for it, and with restaurants like MASH, Flat Iron and Gaucho championing the perfect turf, there is more choice than ever. So, it was only a matter of time before a visit to Steak & Lobster was on the cards. Take a trip to Bloomsbury and you’ll find that it’s not all books and publishing, but also home to some swanky bars and restaurants… and Steak & Lobster is no exception. Housed within the Radisson Blu Edwardian, this laid-back eatery features high ceilings, huge windows and comfy chairs. Take a seat on a plush velvet chair at the bar, or eat by the window facing Bloomsbury Street, as we did. Glass half full: the Strawberry and Rhubarb Fizz. Kicking things off with cocktails, we ordered a Pisco Eldersour (£9), packing Pisco Aba, elderflower cordial, egg white, lime and raspberries into a zingy mix. 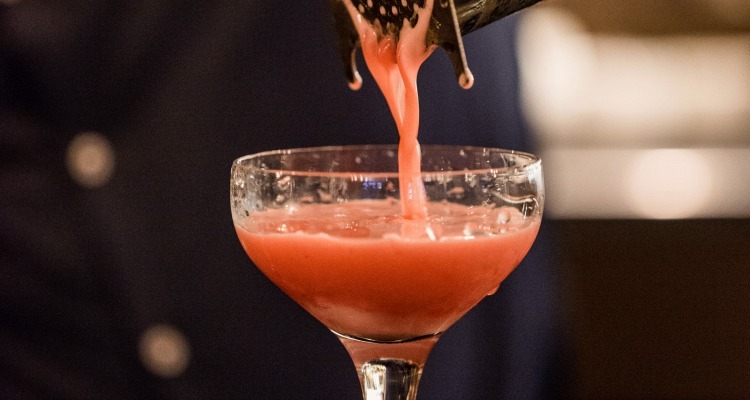 The Strawberry and Rhubarb Fizz (£9) does exactly what it says on the tin, as Skyy vodka is combined with rhubarb and rosehip cordial, strawberries and lemon, then topped with prosecco for a bubbly aromatic finish. We kept it light with starters, knowing that we had a big meal on our hands. The onion rings (£3) are cooked in a moreish cayenne-peppered batter, while crispy smoked beef tacos with lime and crème fraiche (£6) are served flat and bite size – I could have eaten them all over again. Addictive beef tacos and the signature lobster with unlimited fries and salad. When it comes to eating out, I’m an advocate for sharing dishes. Starters, mains, desserts… all of it. The more food I can try, the happier I’ll be. We shared the 14oz Sirloin (£26) – medium rare and a juicy and tender cut. When it came to the 1st lobster (£22), we took the waiter’s recommendation to have it boiled instead of grilled. Succulent and fresh with a tangy lemon butter, cracking open every morsel was a real treat. All to be mopped up with unlimited skinny fries and spicy lemon salad. Soaking up our food with house wine (from £6.25 a glass), we set our sights on dessert. 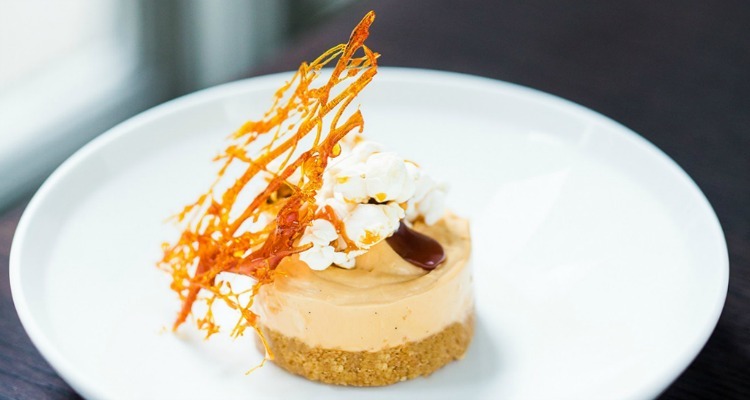 The salted caramel cheesecake (£6) is a stylish little thing; topped with popcorn and spun sugar. If you’re a chocoholic like me, then the signature mason jar (£8) will be more up your street, as this calorific treat combines honeycomb, chocolate fudge brownie and vanilla ice cream with a sweet toffee caramel sauce. Small but mighty: the salted caramel cheesecake. 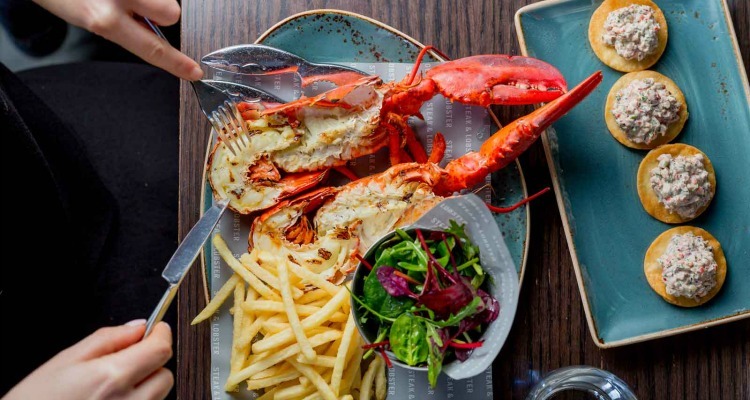 A superb location for a pre-theatre meal, or after-work hangout, Steak & Lobster checks all the boxes. Reasonably priced, yet tasty food? Central spot? Signature cocktails? You can’t go wrong with a meal here. While the restaurant is located within a hotel, the atmosphere is relaxed and down to earth – from the simplicity of the menu, to the stripped back interior.